Friends, for the past couple of years, FJCC has partnered with the Constitutional Rights Foundation USA on a variety of projects. This includes a Gates-funded effort around peer-lead professional development concerning academic discussion models. These models offer a great deal of opportunity for rich and engaging discussion among students. 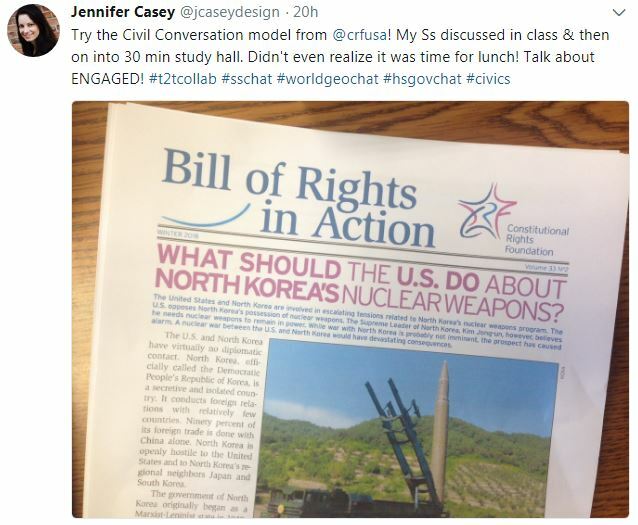 Apparently, students might not even realize it is time for lunch as the tweet from one of the cohort participants suggests (and Jennifer Casey is a teacher worth following if you use that platform)! In the space below, we are sharing with you the recent post from CRF that announces the creation of an entirely online cohort/PLC of teachers seeking new paths towards discussion. It really is worth the effort. Please note too that our friends in Osecola, Duval, Brevard, and Central Florida are still welcome to join the mixed-modes cohort that include a couple of brief face to face sessions as well as the online portions, facilitated by personnel from the Florida Joint Center for Citizenship. If you are in Florida, this is also open to science teachers as well as social studies and ELA folks! MIDDLE SCHOOL AND HIGH SCHOOL TEACHERS A Spring 2018 Professional Development Opportunity for You! Join this national network of teachers who are becoming experts at using academic discussion to increase student learning. Free online PD and lessons focused on discussion strategies for middle and high school! 1. Watch recorded webinars, or join live. 2. Try out discussion strategies with one class of students. 3. Participate in online reflection activities about the discussion strategies. That’s it! Social Studies and ELA Teachers in California, Florida, and North Carolina can earn a $150 stipend. Everyone else will be put in a drawing to win one of ten $150 stipends. Register now: http://www.crf-usa.org/t2tcollab/join If you have questions about the grant, you can email us and we will ensure we get them addressed ASAP.